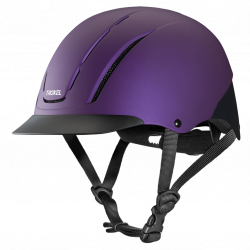 Troxel's #1 riding helmet! Low profile design & DialFit technology work together to create the most comfortable fit for a variety of head shapes. The headliner is removable and washable, FlipFold Fit adjustment, Air-Channel technology. Mesh covered vents provide good ventilation. ASTM/SEI-certified.